The Model 146-801 Mobile Contour Plotter was developed as a simple system to accurately and rapidly transfer the patient’s surface contour to a sheet of paper while the patient is on a simulator table, treatment table or stretcher. This contour drawing can then be used on the treatment plan and made a permanent part of the patient’s record. The contour plotter is a mechanical device which links a drawing pen to a stylus arm. 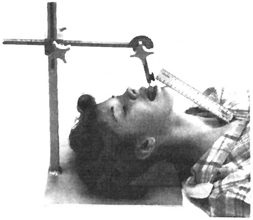 Upon contact with the body, it translates body contours to an overhanging drawing board. When the finger plunger is depressed, engaging the pen, a continuous plot is drawn as the operator follows the physical contour of the patient. Marks can be made along the contour to indicate beam entry and laser light locations. The pen can be of any type — pencil, ballpoint pen or fine felt tip marker. The pen is secured in a special holder with a thumb screw so that the tip is about 1/2" or less from the paper. Pen to paper engagement is through a cable by a finger-controlled plunger. The finger-engaging system is attached to the aluminum stylus arm, allowing easy engagement of the plunger while following the contour with the stylus. The nylon stylus tip is not cold to the body’s touch and is designed to permit skin contact even in the close spacing between the table top and the patient. The drawing board can rotate 360°. It can lock at any angle, enabling lateral and sagittal contours. 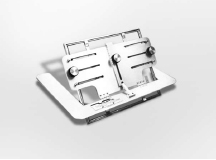 The counter-balanced drawing board is easily adjustable in height to accommodate different patient thicknesses and table heights commonly encountered in radiotherapy departments. It is recommended that computer plotting paper be used for taking contours due to its surface hardness and smoothness; other papers with the same characteristics will also work. Paper can be secured to the board with masking tape. Swivel and locking casters allow the unit to be easily positioned or transported to various areas of the department. HeNe is the standard for patient positioning. The turret design allows for line angulations of ±45°. This means they can be mounted at an angle to the patient couch if necessary without angle brackets. This direct wall mounting provides greater stability. There is virtually no drift and a line width of less than 1mm at ten feet. The green lasers have the same qualities as the red lasers but project green light visible on any skin tone. The high-quality fine line also proves useful in situations such as stereotactic radiosurgery where precision positioning is critical. Designed to be used with wall-mounted lasers, the Back Pointer laser defines the axis of the radiation source as well as the isocenter, regardless of gantry orientation. This offers total flexibility in installation and upgrading of existing systems. The laser generator connects to a fiber optic system and can be mounted either remotely or inside the gantry of the therapy machine. Laser light is piped through a fibre optic cable to a compact projection head that is easily mounted on or in the radiation therapy unit. The cable and optical heads carry no electrical power, so they will not interfere with the equipment. The Back Pointer can be used to define the axis of rotation and radiation source. With the use of overhead and lateral lasers, it can also be used to define the exit axis. The Probe lasers utilize a 635nm red diode that is perceived as four times as bright as a 670nm diode and twice as bright as a 650nm diode. This is essentially the same brightness as the standard HeNe laser systems. 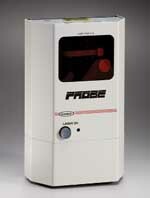 The Probe offers a variable intensity control to adjust the brightness level to room lighting conditions. The base plate of all Probe lasers is the same as the Exact-Align HeNe style so they can be retrofitted into existing installations. The Probe+ has a line width of less than 0.5mm at 2 meters. The unique and proprietary thermal design of the Probe series has no visible "drift". Vertical and horizontal adjustments allow for angular and planar movement, making it easy to install. A versatile optical design allows for ±80° turret rotation. Green light is "absorbed", thereby minimizing line diffusion while maintaining crisp lines. The Probe G has less than a 0.8mm line width at a distance of 3 meters. A unique mechanical design makes it easy to use and maintain. After initial adjustment, no visible drift is seen with the laser lines. The circuitry is also shielded to extend diode life. Each consists of three cross-hair laser units mounted on the walls and ceiling and one saggital laser unit mounted on the ceiling. The Ther-a-Cross "X" provides horizontal, transverse and saggital beams of laser light that intersect to define the isocenter. With the isocenter defined so clearly, patient alignment is precise and positioning time is decreased. Ther-a-Cross "X" systems may be assembled with Exact-Align red or green HeNe lasers or Probe and Probe+ red diode lasers or ProbeG green diode lasers. One type of Tri-Flex system features three crosshair lasers, two for the side walls and one for the ceiling, all mounted on the same plane. The other Tri-Flex system features the same two side wall crosshair laser, but replaces the overhead ceiling laser with a single line saggital laser. This system is useful in situations where a cross laser cannot be mounted directly over the isocenter. Tri-Flex systems can be assembled with Exact-Align red or green HeNe lasers, Probe or Probe+ red diode lasers or ProbeG green diode lasers. The Styro-former® is accurate. A short wire in a rigid box frame keeps the cutting wire tight. There is no perceptive bowing when cutting and it is never necessary to apply pressure downward to keep the wire tight. Accuracy is assured, there is less waste both in time and material, and training of personnel is much quicker. The Styro-former® is easy to operate. The spring-loaded Teflon stylus moves freely in any direction, just like writing with a fine writing pen. It is unhampered by the limitations of an X and Y axis, giving the operator complete maneuverability. Adjustment for desired treatment height is made by a rotating friction drive system operating against the back of the column. This feature greatly eases raising and lowering of the block tray and the universal joint swivel. The Styro-former® allows fast, smooth operation. The source point and block tray are joined together by a calibrated tie rod or by the Styro-former® Power Lift. Once adjustment to your particular treatment machine has been made, the two components can be moved as a unit to any treatment position. This also means that the technologist’s working area remains stationary — always at a comfortable desktop working height. The adjustable block holder and verification light are standard. The entire unit is self-standing, requiring no drilling or bolting into the wall. The Styro-former® can be used with any treatment machine, giving it universal application. 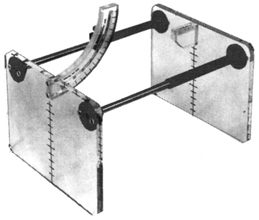 A free-standing film cassette holder eliminates retakes caused by improper cassette positioning. By replacing sandbags and jerry-rigged holders, a free-standing cassette holder permits smoother scheduling and superior X-ray images. 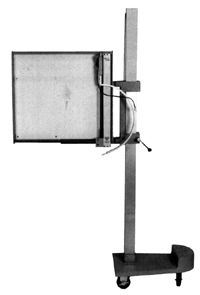 The Flexi·Holder® Model 303-26.5 is remarkably versatile, allowing X-rays to be taken in virtually any angle from floor level to 71+ inches high. 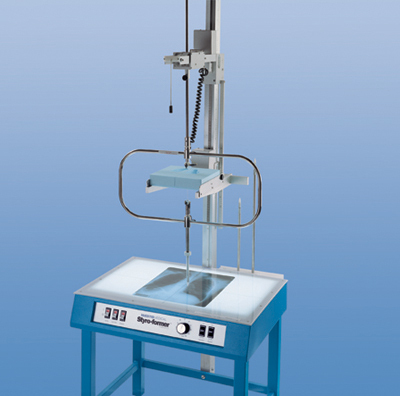 It rolls or swivels into position on large casters, tilts the cassette 180°, rotates the cassette 360° vertically or horizontally and telescopes 26+ inches over the X-ray or operating table. The telescoping arm is counterweighted for easy raising and lowering. A lip on the cassette holder enables the cassette to be inserted with one hand if necessary. Calibration scales on the column and arm encourage exact, repeatable angulation. The sturdiness of the Flexi·Holder® assures both safety and stable positioning. Convenient ratchet handles can be repositioned easily to eliminate interference problems when positioning cassettes. It accepts virtually any type or size of cassette and does not obscure the cassette film area. 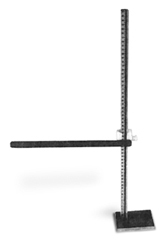 The Flexi·Holder® Model 303-36 is identical in construction and features but with a 36" arm to negotiate around beam stoppers or to place the Flexi-Holder further from a drop floor. The Kodak EC-L film system allows you to achieve a new standard in portal image quality. 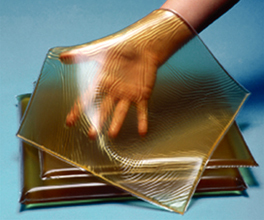 With a more than 3 times improvement in contrast over conventional systems, EC-L film provides exceptional definition of bony structures for more confident verification of treatment fields. Minimum order is 5 packages. 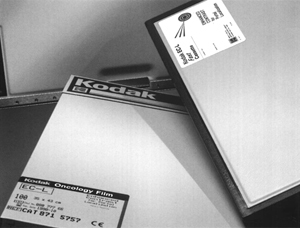 Portal Localization: EC-L Cassettes – In general, standard exposure techniques can be used with the Kodak EC-L film and EC-L oncology cassette. Reductions in exposure techniques may be achieved with the EC-L fast cassette. Both cassettes use a 1.0mm copper front screen and two phosphor-intensifying screens. Portal Verification: EC-V Cassettes – The EC-V verification cassette uses a 1.0mm copper screen and one phosphor- intensifying screen and is generally appropriate for treatment ports with a tumor dose of 90cGy and higher. Portal Verification – X-Omat V radiation therapy film and cassettes can be used for verification imaging. These are available in Ready Pack packaging and can also be used for dosimetry testing. Using an X-Omat V therapy cassette with a localization film will require approximately 1.5 times more exposure to acquire the image. The high mobility film cassette holder is available in two models – one with vertical tilt only, the other with verticle and horizontal tilt capabilities. The high mobility cassette holder is extremely economical and allows fast, steady positioning. The unit rolls on three low-friction swivel casters with toe-operated brakes. Verticle and horizontal adjustments are quick and precise. 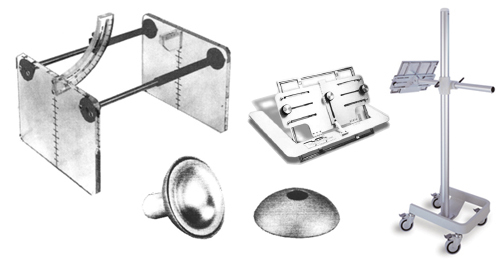 Angular, horizontal and vertical adjustments are secured by a single turn of locking knobs. The holder can accomodate film cassette sizes from 8" x 10" to 14" x 17". The high mobility film cassette holder features strong metal construction with a baked-on enamel finish that makes it very durable. It is supplied in a set of six of assorted sizes, "A" through "F"". Tungsten eye shields have been developed to provide greater shielding than lead for the same thickness and superior electron scatter properties. 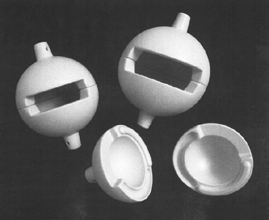 Tungsten eye shields can be gas sterilized or autoclaved. Each tungsten eye shield has a removable 1mm thick and 0.5mm thick anodized aluminum cap (both are included with each eye shield) that additionally reduces radiation backscatter to the eyelid. The entrance dose rate will determine whether the 1mm or 0.5mm aluminum cap is to be used. The eye shields can be used without the aluminum cap when treating superficially. Tungsten shields are available in 2mm and 3mm thicknesses and five different diameters. A stainless steel knob provides a convenient handle. Eye shields protect the patient’s eye during radiation therapy treatments. They are silver-plated and highly polished to fit smoothly under or over the eyelid. The small and medium-sized cups fit under the lid to protect the lens while permitting irradiation of the entire thickness and width of the lids in treatment of superficial basal cell carcinomas of the skin. When only a portion of the lid requires irradiation, an extra large cup with a window is properly placed over the lid. 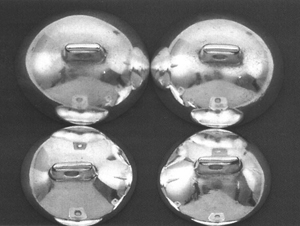 The large solid lead cups are used when areas surrounding the eyes require irradiation, in which case the cups are placed over the eyeball and lid. A complete set consists of four pairs ranging from small, medium and large sizes, and one extra large pair with windows. It is supplied in a velvet-lined storage/carrying case. The eye shields are fabricated of virgin lead, 1/16" thick, and silver-plated for a smoother surface and long life protection. Additionally, a dental boxing wax should be used over the silver-plated lead eye shield to prevent scratching or irritation to the eyeball and for reduction of electron scatter. The lead permits less than 1% transmission of the radiation intensity at 120 kVp (3mm Al HVL). 6MeV electrons have had a 16-25% transmission factor. Electron backscatter from eye shields has been reported to be 40-50%. Lead eye shields are not autoclavable; gas sterilization is required. Always consult the Radiation Physicist when using eye shields with electrons. Please refer to the following paper: Field Shaping in Electron Beam Therapy, by F.M. Khan, Ph.D., Oct. 1976, British Journal of Radiology.